Raised padded cavesson noseband and padded browband. 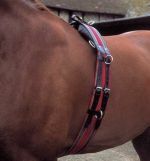 Stainless steel fittings and buckle fittings to the Cheekpieces and reins. Leather Saddle with padded knee rolls and thigh pad. Colour and size : Please Select...Black 14" Black 15" Black 16" Black 17" Black 18" Havana 14" Havana 15" Havana 16" Havana 17" Havana 18"